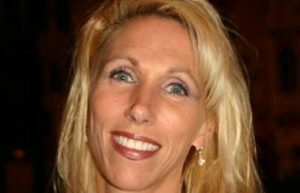 Ruah Woods Press’ First Live Webinar a Success! All praise be to God and His beautiful plans! YES, the new evangelization involves leveraging technology to spread the good news and so… here at Ruah Woods Press, we have completed our first live introductory webinar. 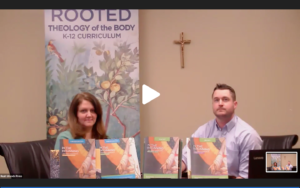 What could be more newsworthy than promoting the world’s first of its kind, ROOTED: K-12 Theology of the Body Curriculum? We were hoping to have a nice sized audience register to view and participate in the live presentation on the afternoon of Tuesday, January 15th… and we were not disappointed. Thankfully, we were blown away by the hundreds of participants from 36 states and 8 different countries, who answered the call to sign-up for our engaging seminar. 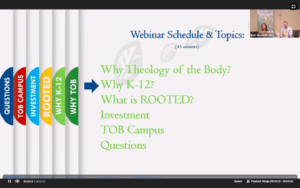 Led by DJ Hueneman, Training and Development Coordinator and Laura Strietmann, Curriculum Consultant, the webinar began with a little background on Pope St John Paul II and why Theology of the Body is so relevant today. The dynamic duo went on to describe the necessity for our youth to discover and assimilate these foundational truths into their innate identity, as in God’s original plan for humanity. Next, an overview of our beautiful ROOTED Curriculum materials and imaginative approach was described and showcased. DJ and Laura spoke about the benefits of becoming a TOB Campus, plus elaborated on our teacher training opportunities. Finally, to round out the 50-minute webinar, DJ and Laura answered questions live submitted by some of our participants. We invite you to view the recorded intro-webinar on-demand! Just CLICK HERE to sign-up and indicate you’d like to see the recorded version of our Jan 15 webinar. Please stay tuned, as we will be scheduling more of these in the near future. God bless all of those who are willing to help our children to grow in the truth & goodness of the faith through the lens of Theology of the Body.